Russia's rouble went into free-fall in Tuesday trading, falling repeatedly to hit record lows, despite the central bank's dramatic decision to raise interest rates from 10.5% to 17%. The rate rise was meant to strengthen the currency. It helped it to 58 to the dollar early on Tuesday, but the dollar at one stage bought as many as 79 roubles. The rouble has lost more than half its value against the dollar this year, hit by cheaper oil and Western sanctions. Both of these have weakened the Russian economy. Russia's central bank has now pledged fresh further measures to try to stabilise its currency, with First Deputy Governor Sergei Shvetsov describing the situation as "critical". Share prices in banks thought to have exposure to Russia were down sharply. In Paris, Societe Generale was down 4.2% and shares in Italy's Unicredit also fell. However, the Russian stock market was higher, with the main Micex index up 2% in afternoon trading. Last week, Russia raised rates to 10.5% from 9.5%, a move that had little impact. The rouble's slide this week was prompted by fears that the US was considering a fresh set of sanctions against the country for its support for separatists in Ukraine. Russian oil giant Rosneft's decision to issue 625bn roubles ($9.9bn) worth of bonds late last week at lower rates than Russian bonds has been blamed by some for exacerbating the currency's decline. But Rosneft denied it was trying to dump roubles, saying "not a single rouble" would be used to buy foreign currency. The chairwoman of the Russian central bank, Elvira Nabiullina, said the latest rate rise should curb inflation and encourage Russians to put more roubles into interest rate-bearing accounts. However, she said she did not expect the rouble's value to be immediately influenced by the rate rise. Media caption"I will have to cut my spending, tighten my belt, deny myself something"
"The rouble is currently undervalued according to all fundamental parameters and the state of the economy... and the current account," she said. "But for the rouble to return to its fundamental exchange rate it would take time." Laith Khalaf, senior analyst at brokers Hargreaves Lansdown, said: 'The Russian central bank has moved to battle stations to defend its currency. So far the move has not stopped the slide, and it may yet have negative effects on the Russian economy. "For investors wanting exposure to Russia, a long-term horizon and a strong stomach are both an absolute must." Yesterday's rouble crash caused barely a ripple on Russia's primetime news last night, but today the battle to save the currency has been taking centre stage. Bulletins on the three main channels on 15 December led with a health scare for a famous poet and the aftermath of the siege in Sydney. Official channel Rossiya 1 ignored the rouble completely, while state-controlled Channel One and Gazprom-Media's NTV both dedicated around a minute to the story - in NTV's case close to the end of the hour-long bulletin. Channel One used a somewhat misleading screen graphic that understated the currency's collapse. 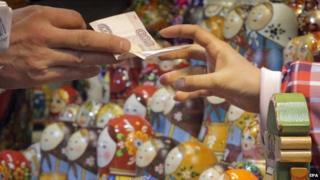 It also warned that shops displaying prices in any other currency than the rouble could face stiff fines. The rouble had fallen by more than 10% on the day. The last time state TV tried to hush up such a dramatic and nationally important event was when all three main channels completely blanked the protests that followed the disputed parliamentary election in 2011. Tuesday's early afternoon bulletins though led with Russian Central Bank head Elvira Nabiullina defending her decision to hike interest rates. "The Central Bank has given its answer to speculators," Rossiya 1 declared in its news headlines. Russia's central bank has previously tried unsuccessfully to stabilise the currency, buying roubles in the markets. It has spent more than $70bn (£44.7bn) supporting the rouble since the start of the year. "This decision is aimed at limiting substantially increased rouble depreciation risks and inflation risks," the central bank said in a statement. Last week, the World Bank warned that Russia's economy would shrink by at least 0.7% in 2015 if oil prices did not recover. It says an oil price of $70 a barrel would leave it with a fall of 1.5%. Capital Economics' latest prediction is for a contraction of 2%, should the price of oil remain close to its current price of $60 a barrel. Raising interest rates has its own risks, as more expensive borrowing can itself slow growth. But it may also stem the tide of money leaving the country. Oil prices are at levels not seen for five-and-a-half years. US benchmark crude West Texas Intermediate is below $55 a barrel, while North Sea Brent crude is trading below $60 a barrel. Both benchmarks have fallen by almost half since June. When Russia's Central Bank raised its base rate by one percentage point last week, it was like a doctor giving a seriously ill patient a headache tablet. Now, it seems, the bank has reached for the defibrillator. The 6.5 percentage point increase in the key rate to 17% is a desperate measure. But then the situation is looking increasingly desperate. On Monday, the rouble suffered its sharpest fall in more than 15 years, losing about 10% of its value against the dollar. Moscow's RTS share index plummeted 10%. On the streets of Moscow yesterday, there was no sign of panic, there were no queues outside banks. But the Central Bank knows it needs to bolster the national currency to prevent panic from setting in. Hence the large rise in the key interest rate. But there is a risk. High interest rates slow economic growth, and that's not good with Russia on the verge of recession. Is Russian economic malaise Putin's biggest challenge yet?